Consisting of: Blueberry, Cranberry, Grapeseed, Strawberry, Raspberry, Pomegranate, Bilberry, Alfalfa, Carrot, Beet, Broccoli, Acai, Chokeberry, Apple, Apple Pectin, Maqui Berry, Grape Skin, Black Cherry, Tomato, Barley, Celery, Chlorella, Black Currant, Artichoke, Mango, Pineapple, Spirulina, Chlorophyllin, Dandelion, Wheat Grass, Green Tea, Milk Thistle, Eleutherococcus senticosus, Ashitaba, Bing Cherry, Elderberry, Goji Berry (Lycium barbarum), Grapefruit, Mangosteen, Spinach, Tart Cherry and Papaya. 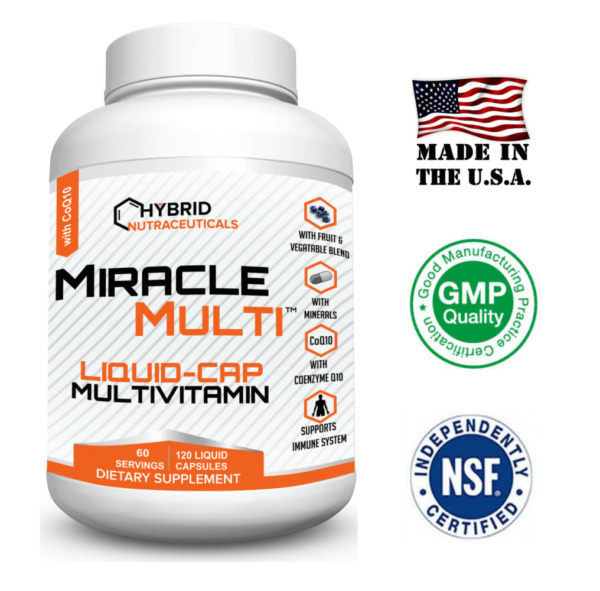 Use MiracleMulti Liquid-Caps for at least 30 days. If you are not 100% satisfied, tell us why and get a complete refund of your purchase price (no return of product).